Filmprikbord.nl - berichten voor de Filmwereld - Laatste oproep, dien je short film in!!! Laatste oproep, dien je short film in!!! Da Bounce Urban Film Festival is looking for ambitious young filmmakers! DBUFF2018 invites filmmakers to submit their Urban Short Films; both narrative and documentary films. 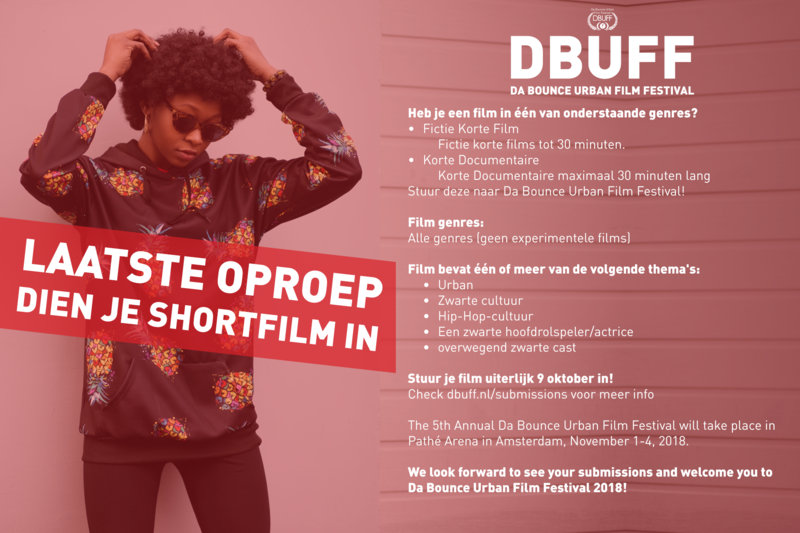 The 5th Annual Da Bounce Urban Film Festival will take place in Pathé Arena in Amsterdam, November 1-4, 2018. We look forward to see your submissions and welcome you to Da Bounce Urban Film Festival 2018!